As a culinary herb Rosemary (Rosmarinus officinalis) is widely grown in the kitchen garden. However with dwarf and prostrate varieties it is also a useful landscaping plant. Used a herb in cooking all varieties have similar characteristics in the the aromatic foliage, however growth habits differ with some being prostrate and flower colouring being either blue or pink. Rosemary plants are drought tolerant, can easily be pruned and are generally easy to grow. Easy to grow, a well drained soil in a sunny to part shaded position is best and these tough plants require little care. They do well in most soils and seem to thrive on neglect. Purple flowers are attractive to bees. It responds well to pruning and it is fairly easy to propagate new plants by striking cuttings from pruned pieces. Rosemary will also do well it pots and is reasonably drought tolerant once it is established. Varieties vary in growing habits from trailing or prostrate forms to upright plants. The foliage when crushed or rubbed releases an aromatic fragrant oil. As a culinary herb it is used widely with lamb dishes. Rosemary plants can also be used as a low hedge around the vegetable or herb garden. Propagation is easy from cuttings, from seed rosemary can be difficult to propagate. Position – Best in full sun. Watering – Regarded as drought tolerant once established, some additional water during very long dry spells will be beneficial. 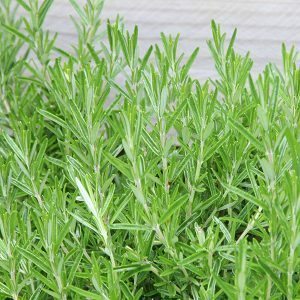 Foliage – Evergreen, aromatic when rubbed and a mid to green in colour. Flowers – Purple in spring to summer. Height – Rosemary plants can reach over 1m (3 ft) in height in good conditions. Rosmarinus officinalis ‘Shimmering Stars’ is a wonderful variety with masses of flowers. Will reach around 1m and is a hardy plant. A prostrate form known as Rosemary ‘Huntington’s Carpet’ will reach around 50cm, however this is difficult to find in Australia in its true form.